Each design in the Strong Collection is made of millions of diamonds permanently fused together in an extraordinary marriage of refinement and strength. The polycrystalline diamond material, Polydiamond, is extremely strong and the perfect expression of unbreakable, everlasting love. Polydiamond is a 10 out of 10 on the Mohs Hardness Scale. It will not scratch, bend, or fade in any conditions and will outlast every other type of jewelry on Earth. The extreme hardness, durability, and thermal conductivity of Polydiamond make it an ideal material for many industrial and scientific uses. The black color is a result of these millions of diamond crystals pressed together in non-symmetrical orientation, thus absorbing light rather than light passing through as it does a single diamond crystal. Polydiamond is available in a matte or polished finish. The Strong Collection rings are proudly made in the USA by Elysium Black Diamond and are designed for both men and women. They are equally appropriate as everlasting wedding bands and audacious fashion rings. Polydiamond is diamond. More specifically, it is a human-made material that is created by growing many (hence the prefix of 'Poly') diamonds together into a tightly interlocking structure that has superior hardness, toughness and wear resistance than mined diamonds. The extreme hardness, durability, and thermal conductivity of Polydiamond make it an ideal material for many industrial and scientific uses. It has been used for decades for everything from mining to manufacturing. Polydiamond is also FDA-approved for hip, knee, and vertebral replacements. It is ideal for joint replacements for many reasons - highly biocompatible, extremely durable, and almost completely inert. Just as our namesake Ada Lovelace saw 'Poetic Science' in the world's first computer, Ada Diamonds sees Poetic Science in Polydiamonds and have repurposed the material to make durable yet beautiful jewelry for strong men and women. HOW IS POLYDIAMOND DIFFERENT THAN DIAMOND GEMSTONES AND WHY IS IT BLACK? A diamond gemstone is cut out of one single rough diamond crystal; it a monocrystalalline diamond. Polydiamond material is made up of millions of microscopic nanodiamonds, making it polycrystalline diamond. Ada Diamonds shortens polycrystalline diamond to Polydiamond. In the same way that light will pass through one glass marble but not pass through a million marbles, light will not pass through a million diamonds. Ada's Polydiamond material is made in a very similar process to how our regular diamond gemstones are grown. Both are cultured in High Pressure High Temperature (HPHT) pressure cookers. Both our Polydiamond and diamond gemstones are made by heating carbon up to approximately 1500 degrees C and pressurizing it to approximately one million PSI. The major difference between diamond gemstones and Polydiamond material is the type of carbon placed in the growth cell. Diamond gemstones are grown from a single diamond seed, whereas Polydiamond is grown from a fine diamond powder with no central diamond seed. The microscopic diamonds inside Polydiamond material are intentionally bonded together in non-symmetrical orientations to make the material as strong as possible. Specialized lasers are used to CNC cut and polish the Polydiamond into beautiful jewelry. Ada's Polydiamond material is proudly made in Utah by Elysium Black Diamond. No. Polydiamond can only be grown in carefully controlled conditions of a laboratory, and is not found in the Earth's mantle. There have been small amounts of low purity Polydiamond found on the surface of the earth; however, that material is extraterrestrial in nature - it was produced by a large meteoritic impact. WHAT ARE OTHER USES FOR POLYDIAMOND? WHAT SURFACE FINISHES ARE AVAILABLE? Ada offers both a matte and a polished gloss finish. Both finishes are achieved with state-of-the-art diamond cutting lasers. The gloss finish is created by carefully laser polishing the surface of the Polydiamond to a very uniform finish. This surface is highly reflective. The matte finish is achieved by intentionally creating an irregular surface at the atomic level. This irregular surface absorbs light in a unique way, creating a deep finish that is unlike any other type of jewelry. WHAT OTHER MATERIALS ARE USED IN THE STRONG COLLECTION? Various pieces from the Strong Collection use cultured diamond gemstones, platinum, 18k gold, silver, and stainless steel. CAN POLYDIAMOND RINGS BE SAFELY REMOVED IN AN EMERGENCY? Yes. Unlike titanium, cobalt, or tungsten rings, Ada's polycrystalline diamonds can be quickly and safely split in half by medical professionals in the event of an injury to a finger. While the polycrystalline rings are far stronger than any metal, they are very rigid. With enough pressure in a vice or with vice grips, the ring will safely split in half. Ada does not sell rings made from hard metals such as titanium, cobalt, or tungsten due to safety concerns. Many Emergency Rooms around the world are not equipped to remove hard metal rings. If your ring cannot be removed after a traumatic injury, blood flow to the finger may be constricted enough that amputation is required. HOW DO YOU CARE FOR A POLYDIAMOND RING? It is very easy to care for a polycrystalline diamond ring. It will not scratch, dull, fade, or wear in any way. 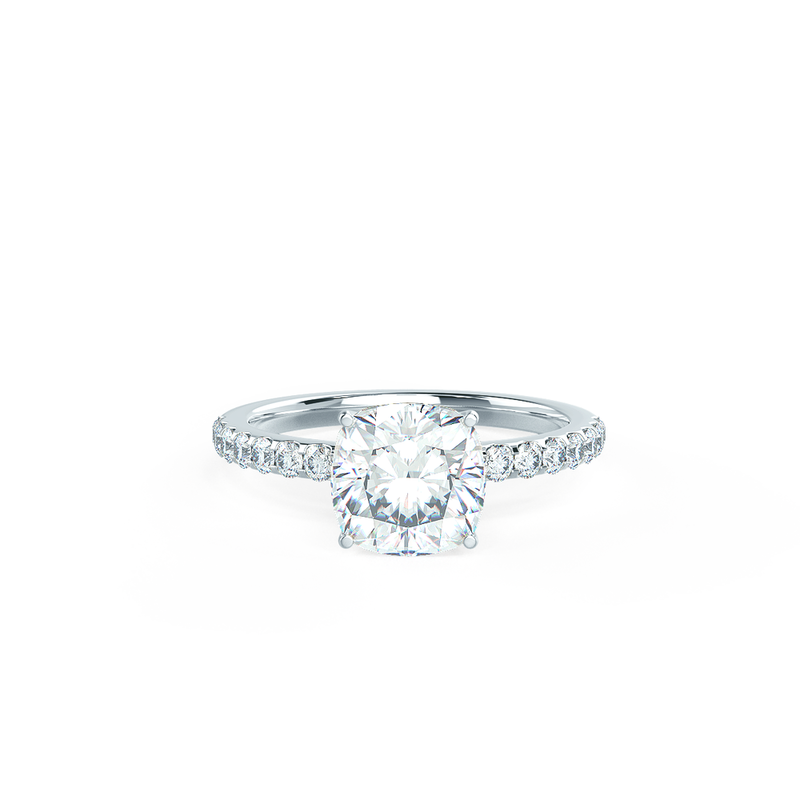 It does not require any special cleaning or any chemicals to keep the ring looking brand new. Because the matte Polydiamond has an irregular surface, you may get foreign material embedded in the surface of the ring from time to time. This foreign material will look like small scuff marks. Most scuffs will come out with hand soap and water, but some metallic scuffs may require a quick clean of the ring with a Scotch Brite scrubbing pad, steel wool, or fine grit sandpaper to remove the scuff. WHAT RING SIZES DOES ADA OFFER AND WHAT IF I NEED TO RESIZE MY RING? Ada offers sizes 6 to 12.5 in half size increments, and the Beveled ring is available in size 13 as well. Ada offers an 18-month ring size exchange free of charge. Subsequent to the first 18 months, there will be a nominal fee applied for size changes. CAN ONE BE ALLERGIC TO POLYDIAMOND? No. The FDA has done extensive clinical trials of Polydiamond before approving it for orthopedic implants. It has proven to be completely non-toxic, non-inflammatory, and safe for long term contact inside or outside of the human body. Polydiamond contains no nickel or copper. Not at this time, however, Lavoisier diamonds may be used for the One in a Million Rings. Ada Diamonds is conducting R&D on Lavoisier Polydiamond material, and hopes to offer Lavoisier Polydiamond in mid-2017. Polydiamond jewelry can usually be delivered within 2-3 weeks of order date. Custom orders or inlay rings may take longer. Please contact the Diamonds Concierge Team at hello@adadiamonds.com if you have a tight timeline or a special request. If nothing fits your fancy, our Diamonds Concierge Team is also available to help build a bespoke creation to your specifications utilizing Polydiamond. Ada Diamonds offers an unconditional lifetime warranty on all of our polycrystalline diamond material in our Strong Collection. Ada maintains the highest quality standards and guarantees zero imperfections in design, materials or workmanship. Any jewelry not meeting these exacting standards will be repaired or replaced at no charge. Megadiamond is another term one could use for Ada's Strong Collection, as each piece in the collection contains well over a million (hence the prefix 'Mega') diamonds. Depending on the ring size and style, Ada's Polydiamond rings each contain approximately 15-25 million diamonds. ARE STRONG COLLECTION RINGS FASHION OR BRIDAL? Both! While the majority of Ada's Polydiamond Ring sales are men's wedding bands, we have delivered many rings as right-hand fashion rings. We've fabricated rings for thumbs, pinkies, and all other fingers in-between. We have both male and female customers for our Strong Rings. Our team of jewelry designers see our cultured diamonds as a blank canvas with which to create beautiful works of art. Ada Diamonds offers the world's premiere cultured diamond jewelry, as well as custom grown stones through Lavoisier.